This page will show you Eminem's tattoo collection. Eminem got a new tattoo saying "Proof" down his left arm. The same way Proof had his. This tattoo is aimed at Eminem's (divorced) wife Kim Scott. It pictures all the troubles Marshall went through because of Kim, including their arguments. At this time, Marshall had broken up with Kim and he didn't intend to get back to her. 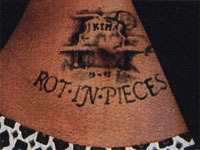 It shows a picture of an open grave with the words "Rot in Pieces" below. Rot in Pieces also represents a grave with Kim's name. It had something definitive in the meaning, but it is also the expression of a great pain Eminem was unable to swallow. 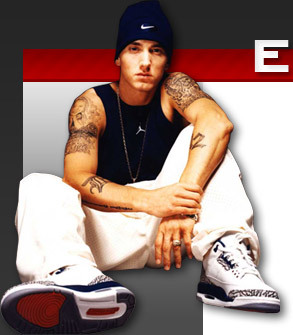 The "D" on Eminem's right forearm stands for Marshall's hometown, Detroit and also for the D12 group, representing "Dirty". The 12 on Eminem's left forearm represents "Dozen". 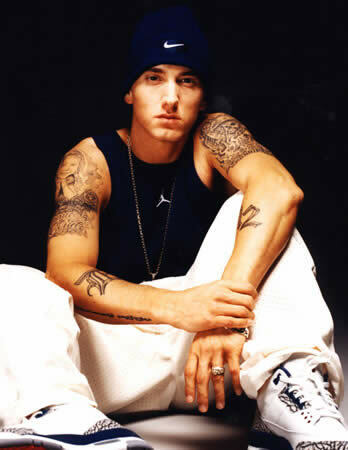 If you put both forearms together, in addition you have "D12". This is the second part of the above tattoo. bracelet on his wrist which he had done whilst drunk. The gothic bracelet on his left wrist has no particular meaning, because Eminem forgot about the original meaning of the bracelet. Probably because he was drunk when he got it done. 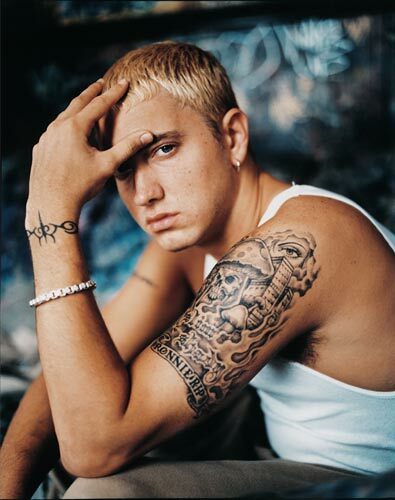 Eminem got this tattoo as a mark of respect for his uncle, Ronnie Pilkington, who committed suicide back in 1991. Eminem was much closer to his uncle, who first introduced him to HipHop, than anyone else in his family and often includes uncle Ronnie in some of his lyrics. This tattoo is very artistic : it is related to the ghetto life in Detroit. You can see a huge mushroom along with buildings and the eye of a whore. This tattoo is a portrait of Eminem's daughter, Hailie Jade, with some roses around her. It also has the words "Bonnie & Clyde", which was also a song on The Slim Shady LP, and which was also dedicated to his daugther. 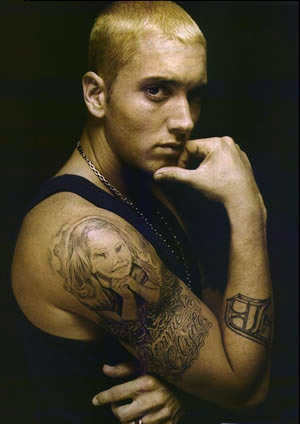 On his right shoulder Eminem has a Hailie tattoo that is his most recent tattoo. There is a picture of Hailie smiling and < Bonnie and Clyde > is written beneath. It reminds us of the great complicity between father and daughter. The roses are, of course, a symbol of his everlasting love for Hailie. Before getting this tattoo done, he had a tattoo here which simply said "Eminem".